This page is designed to give a general overview of popular low-carb diets, links to books and further information are provided. Best aspect / worst aspect information is subjective. We encourage you to do your own research and discuss your plans with your GP. For most diet plans, there are books that provide detailed information and full set of guidelines. 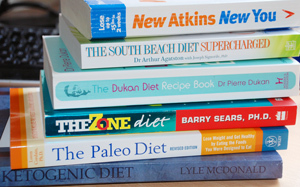 It is definitely a good idea to read the book before starting your selected diet. Atkins diet (officially called “Atkins Nutritional Approach”) was popularised by Dr Atkins in his book Dr Atkins’ Diet Revolution, first published in 1972. The book was revised and re-published in 2002, and again in 2010. The diet consists of several phases and is focused on limiting the amount of net carbs consumed every day, with permitted amount starting at 20g a day in the first phase and then increasing gradually. Dukan diet was developed in France by doctor Pierre Dukan over 30 years ago, but gained widespread popularity in early 2000s, since the publication of The Dukan Diet book. Dukan imposes carb and fat limits on protein-only days, when no carb is allowed and fat is kept to a minimum. There are also protein/vegetables days, where salad vegetables are allowed but starchy vegetables, other carbs and fat are not. The main principle behind Paleo diet is eating like our ancestors did in the Paleolithic era, which lasted for over 2 million years and ended about 10,000 years ago with the development of agriculture – relatively recently in evolutionary terms. The advocates of the diet argue that human body has not yet had the time to evolve to properly digest foods made available by agriculture, such as grains, legumes and diary. Ketogenic diet (often called just “keto”) is a nutritional approach that aims to induce ketosis by restricting the amount of carbohydrates to a minimum. Ketosis is a natural state that occurs once the body starts burning fat for fuel instead of carbohydrates. The usual ketogenic range for most people is 20-30g net carbs a day, although highly active people can go up to 50g and stay in ketosis. Originally developed as a way to prevent heart disease, The South Beach diet also gained popularity as a weight loss plan. Creators of the diet, cardiologist Dr Agatston and dietician Marie Almon, don’t refer to their diet as low-carb, although it is likely that many people who follow it would end up consuming less carbs than before.